Origins is now available on Kobo + a progress report on Exploration. Book 1, Origins is now available on Kobo. Book 2, The Hunt has just started shipping out to the online retailers. I’ll post updates when it becomes available in various places. As for now, it’s available through Amazon and Smashwords. Progress widget for book 3 – Exploration. Like I did for the previous book, I’ve added a progress widget to the right side of the page so you can keep up with the progress of book 3. So far, only the first chapter is done, but let me tell you…it’s one seriously intense chapter, and I’m really happy with how it came out. Last night I designed the cover for book 3, and I really went all out with this one. It looks really sharp if I do say so myself. I’m not going to pre-reveal it though other than showing it to a few friends who’ve been reading the series. So what’s the title of book 3 going to be? I’ve been rolling some things around in my head about where I’m going to be taking the series in book 3, and I’ve come up with a few things, which is really all I need to get started on it. I have some other matters that need my attention at the present time, otherwise I’d have already been writing. I’m guessing that I’ll probably begin work on it in a few days from now. Series and Trivia pages updated for The Hunt. I’ve updated the Series and Trivia sections with info about The Hunt. Unseen Things: The Hunt has arrived! 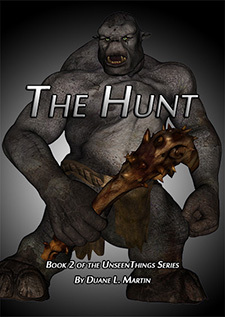 Unseen Things: The Hunt is now available in epub format from Smashwords, and in Kindle format from Amazon. Both Origins and The Hunt also have pages on Goodreads. It’s awaiting Premium distribution status at Smashwords right now, but once that’s approved it’ll be sent out to all of the same online retailers as Origins. I really hope you all enjoy this book, as I put a tremendous amount of work, and a whole lot of heart into it. Book #2, Unseen Things: The Hunt, is finished, and in only 13 days! The word count before editing and proofing came out to be 80,891, but that may increase by a few thousand during the editing process if the first book was any indication. I’m not sure how long the editing will take, but I’m thinking possibly a week or a week and a half. Then after that I’ll do the copyright thing and then get it published and out there. I’ll post an announcement when it’s actually available, and add another widget specifically for that book with links to where you can get it.